Republican and Democratic politicians are once again attacking Internet freedom and Americans’ privacy rights. This time, it's the Cyber Intelligence Sharing and Protection Act (CISPA). While news media was focused on the dramatic events of last week, the U.S. House of Representatives quietly approved CISPA, with a vote of 288 to 127. CISPA allows the government to snoop on private emails. It grants companies the right to disseminate individuals’ sensitive, private information — like medical records — without their knowledge or consent. And it grants those companies broad immunity from civil and criminal prosecution, making them easy targets for government arm-twisting. The House approved a CISPA bill in 2012, as well, but it died last year before coming to a vote in the Senate. This year, Republicans and Democrats have joined forces to renew the CISPA assault on Internet privacy and liberty. The Libertarian Party is the only political party in America that consistently and vehemently opposes any infringement of civil liberties. The LP platform states, "Protection from unreasonable search and seizure should include records held by third parties, such as email, medical, and library records." 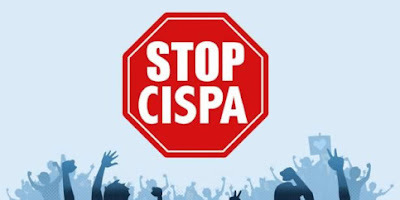 The White House has issued a statement that President Barack Obama's advisers will recommend that he veto CISPA if it reaches his desk in its current form. The Libertarian Party urges every civil libertarian to warn federal politicians that any further advancement of CISPA will be met with dire consequences to their political influence. The Fourth Amendment applies to governmental searches and seizures, but not those done by private citizens or organizations who are not acting on behalf of a government. The Bill of Rights originally only restricted the federal government. However, in Mapp v. Ohio, 367 U.S. 643 (1961), the Supreme Court ruled that the Fourth Amendment applies to the states by way of the Due Process Clause of the Fourteenth Amendment. Moreover, all state constitutions contain an analogous provision.